Biochemical reactions may be viewed as discrete event processes characterized by a number of states and state transitions. These processes may be modeled as state transition systems with transitions representing individual reaction events. The time-evolution of the state occupancy probabilities of such systems is described by the master equation. Since these systems often involve a large number of interactions, it can be difficult to construct the master equation for a model describing a system, and since the resulting models can involve a huge number of states, solving the associated master equation can be difficult or impossible. Here, we describe a method for the specification, construction, and reduction of finite state transition system models of biochemical processes using the symmetry and invariant manifold reduction techniques. The method allows a user to specify transition rules using an intuitive graphical representation, and to automatically construct the transition matrix of a differential equation characterizing exactly the dynamics of a model, with a potentially significant reduction in dimension when compared to the full master equation of the model. Vernan can be used to construct models of complicated discrete-state processes, such as calcium release from the calcium release unit of cardiac myocytes. 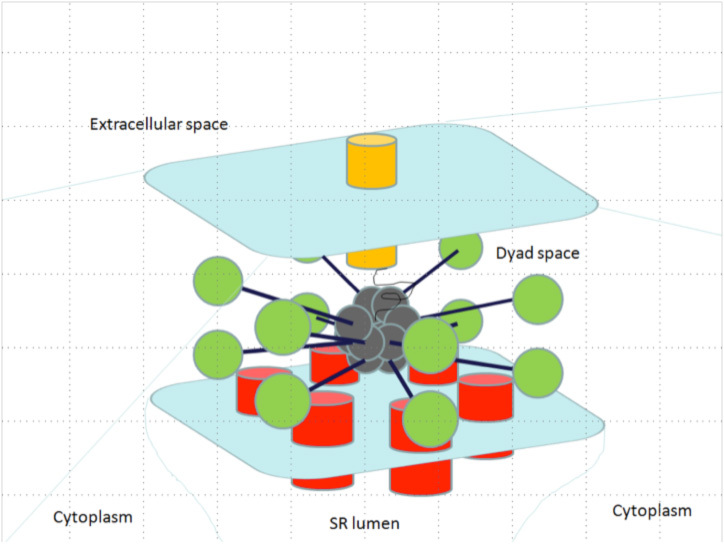 Here, a hypothetical calcium release unit is illustrated containing an L-type calcium channel (yellow cylinder) on the plasma membrane surface closely opposed by six SR calcium release channels (ryanodine receptors; red cylinders) on the SR junctional foot process as well as a single calmodulin-dependent kinase (CaMKII) dodecamer (green spheres) tethered to the L-type calcium channel. Vernan can help facilitate model specification, construction, and reduction for such a process.